Peoples’ Self-Help Housing President/CEO John Fowler accepts a $4,000 grant check from Bank of the Sierra’s Market President Kelli Blackburn and Special Assets Officer Charlie Fruit. 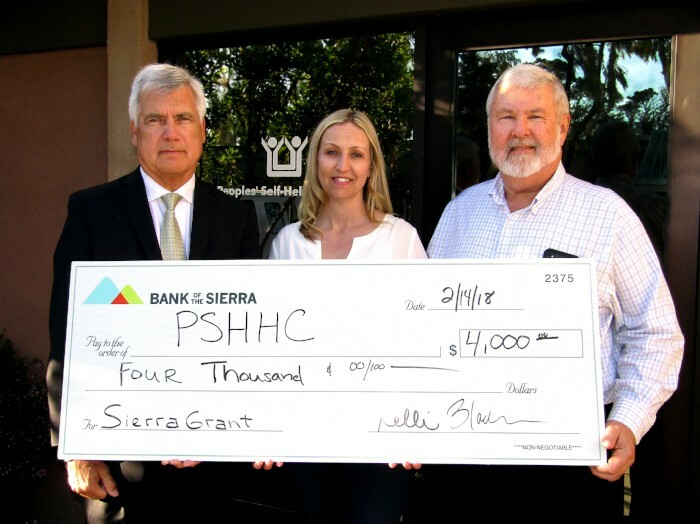 San Luis Obispo, Calif., February 16, 2018 – Peoples’ Self-Help Housing (PSHH) proudly accepted a $4,000 Sierra Grant from Bank of the Sierra (BOTS). Market President Kelli Blackburn and Special Assets Officer Charlie Fruit stopped by the PSHH offices in San Luis Obispo to present the check to PSHH President & CEO John Fowler. Charlie is also the Vice Chair on PSHH’s board of directors. The Sierra Grant will support PSHH’s educational programming tutoring, reading, English literacy, career readiness and other enrichment services. BOTS fulfills grant applications quarterly throughout the year in amounts that average between $1,000 and $5,000. Each Market President has the ability to screen requests submitted by local nonprofits that will be forwarded for consideration to the BOTS grant committee. Founded in 1970, PSHH is the largest nonprofit affordable housing developer on the Central Coast. With a mission of building homes and providing services to strengthen communities and change lives, PSHH serves low-income households, working families, seniors, veterans, those living with disabilities and the formerly homeless. It also provides homeownership opportunities through a self-build, “sweat equity” program that has seen nearly 1,200 homes successfully completed. Through its developments and offices, PSHH has a presence in San Luis Obispo, Santa Barbara and Ventura counties, manages over 1,800 rental units, and employs nearly 200 members of staff. For more information on PSHH, visit www.pshhc.org, email info@pshhc.org or phone (805) 781-3088.